A “monster galaxy” that formed just one billion years after the Big Bang is spewing out stars at such a fast rate it will be consumed within the next 100 million years, scientists have discovered. By mapping the COSMOS-AzTEC-1 galaxy, which is located 12.4 billion light years away, researchers were able to show it is highly unstable and is currently pumping out stars at a rate 1,000 times faster than the Milky Way. Submillimeter-bright galaxies like AzTEC-1 have posed a cosmological mystery since they were first discovered two decades ago. They are extremely bright and form stars at a very fast rate. However, scientific models suggest these galaxies should not exist—computer simulations cannot account for all their features, including their young age, their huge mass and their rates of star formation. Using the Atacama Large Millimeter/submillimeter Array (ALMA) Telescope, an international team of scientists has now produced a map of one of these monster galaxies. Their findings, published in the journal Nature, will help begin to answer questions about the formation and evolution of these cosmic question marks. 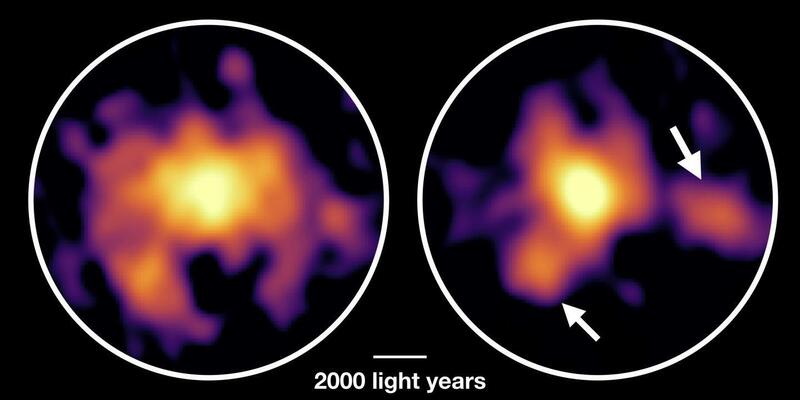 The new map shows never before seen structural details of the galaxy, as well as its dynamic properties. Intriguingly, they discovered AzTEC-1 has an ordered gas disk in a regular rotation. The scientists had expected it to be “a disordered train wreck,” as that is what their theoretical models had predicted. Their observations also indicate the gas disk is extremely unstable, and this is likely fuelling the extreme star production. The instability is unusual—normally the gravity and pressure of a galaxy will reach a balanced state and at this point, star formation regulates at a moderate pace. The instability of AzTEC-1, caused by the pressure being far weaker than the gravity, has led to runaway star formation. Scientists estimate the whole galaxy will be consumed by its intense star formation in around 100 million years. 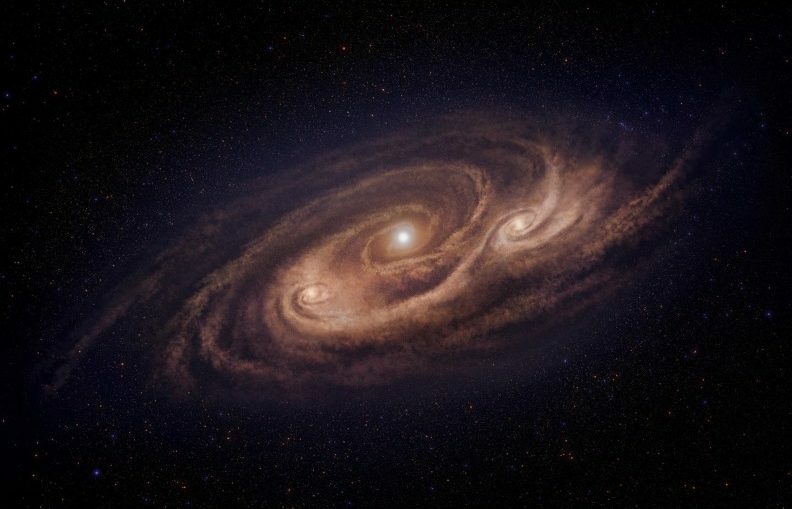 Within the disk they found two huge clouds of gas thousands of light years apart and it is these regions where the team believes stars are being made—normally there is one gas cloud at the center of a galaxy driving formation. The authors speculate the instability observed could be the result of a galaxy merger, where two galaxies collided sparking a period of intense star formation. Researchers say this is the “most straightforward scenario” as simulations have produced the physical properties seen.